Xochimilco, the place of the flower fields (in Nahuatl), is at once an ancient Aztec dream, a modern Mexican fiesta, and an eccentric eerie nightmareall in one glorious experience and all in one day. Imagine in one short Mexico City afternoon floating between two cultures centuries apart, with the added fillip of a hidden island of ghosts and dead dolls. Very little remains of Aztec daily life and splendor. Aside from the pyramids, and artifacts displayed in museums, we can only guess at the wonders of Tenochtitlan while we stand in the middle of Mexico Citys Zocalo and stare at the cathedral sinking slowly into the ooze of the primordial lake below. 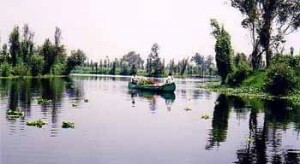 In pre-Hispanic times the Xochimilcas built rectangular soil-covered rafts (chinampas) in Lake Xochimilco, which with time became islands rooted to the bottom and separated by water-filled canals. Perhaps because the Floating Gardens of Xochimilco were built on the eternal lake, they still exist. Thankfully they have been restored and reclaimed from the pollution and neglect that almost caused their extinction, and Xochimilco was declared a UNESCO World Heritage site in 1987. Not only do the floating gardens enthrall visitors and tourists, but they are still used today as they have been since the Tenth Centuryto grow plants, vegetables and flowers for central Mexico. 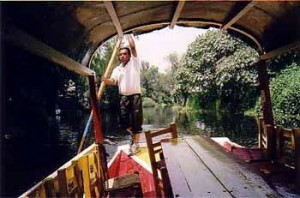 You feel like youre at the seaside as you enter one of Xochimilcos many embarcaderos filled with the colorful flat-bottomed boats called trajineras. Now duplicated in crepe paper, in times past the multicolored designs with girls names on the front and tops of the boats were made of fresh flowers. Still for special occasions, arrangements can be made in advance for real floral decorations to cover the boat and to spell out the name of the honoree. There are so many crafts waiting that you can walk from deck to deck all across the landing to the one of your choice. You hire a trajinera by the hour, and unfortunately most tourists opt for only one hour, imagining that they have seen what there is to see and rush off to the next attraction on their Mexico City list. For such an extraordinary historical, cultural, and natural site, there is little hype in the travel media. But the local Mexican people know how to party and enjoy themselves, and on weekends the smaller, higher section of the canals and gardens are jammed with vessels and competing floating mariachi bands, stern to port, starboard to starboard, at times resembling bump em boats at a carnival. Like in Venice, the gondolas are propelled by one man (and here sometimes a strong woman) standing on the back with a long pole. Our boat with a long narrow table and twenty yellow straw-bottomed chairs, contained only my friend, myself, and a plastic bucket of iced beverages, but even when a boat is party packed, one person provides the power. The only mechanical sound on the canals is from the occasional police motor boat. The trajineras move in silence, but the happy people on them are loudly partying as Mexicans do better than anyone. The fiesta boats generally have refreshments brought from home, but if anything is forgotten (and for the more casual cruiser who is less prepared) vendors conveniently drift by selling flowers, drinks, candy, souvenirs, fresh hot snacks and main dishes, blankets and rebozos, as well as floating photographers to commemorate the moment. There are boat after boatload of uniformed mariachis and vessels containing only a single mirimba, which tie up to the party boats during the short concerts paid for by the song. Our gondola barely squeezed by a flotilla of six tied together two by two, plus the required aquatic mariachi attachment. Women were dancing on the three feet of deck when we collided, spilling beer and flowers into the canal, but the fiesta continued with even more laughter as we passed them by. People wave and call out to each other. Several parties had family members regaling their captive partiers with jokes, and we laughed as well. Homes and plant nurseries and green houses of roses line the upper canals; floating bridges are hauled by ropes into place when necessary for crossing. The islands have no cars, and there are small private gondolas used by residents for transportation. The Aztecs brought in everything to their city on boats such as these, and today the canals are used in much the same way. Soon we arrive at the lock and descend to the lower and larger area of islands which are pastoral cornfields, farms and pasturelands of grazing animals. We pass indian children in green canoes filled with flowers, and two small boys paddling home with their bicycle on board. No mariachi boats, only the quiet kiss of the water as the gondolier poles us forward. Lazy trees lounge on the banks trailing their limbs in the water, bright red bougainvillea punctuates the green stillness, an occasional mudhen navigates through the waterlilies, a salamander suns on a rock, fish disturb the waters satin surface, insects and birds sing. Another worldmystical, serene, timeless. Our festive trajinera seems anachronistic, but we are too blissful to care. The mood changes when we land at the Isla de las Munecas, the Island of the Dolls. Don Julian lived there for fifty years, and for the twenty-five before his death two years ago, sought to appease the ghost of a drowned child with the dolls he pulled up from the depths of the canals. 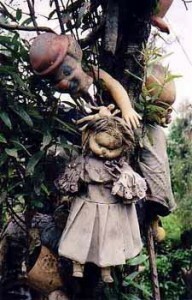 Dead dolls of all kinds hang from the trees and vines and rafters, their eyes bewitching and disturbing the visitors who have come to gawk and photograph in this surreal sanctuary. There is an altar to Don Julian, and in an open shed, a kind of museum. As the fame of the Island of the Dolls spreads, people all over the world send their own dolls to be displayed and to disintegrate, covered by cobwebs and dust with all the rest. It can be disconcerting to see your favorite Betsy or Ginny naked, muddy, missing a limb, and hanging by the neck. While bizarre and off-putting for some (one woman tourist refused to get out of the boat), the island is in fact a kind of work of art in the realm of other one mans fantasy environmentsEdward James, Simon Rodia, even William Randolph Hurst come to mind. Don Julians family is carrying on the tradition, and the creepy feel of wandering among childhood toys once beautiful and cherished now tainted by evil and death, is balanced by Don Julians jovial nephew barbecuing fresh corn under the palapa and laying out juicy limes and chili for the tequila he proudly serves us. Even so, one journeys back to the lock and to the parties and festivities in the high canals and then to the busy embarcadero and home, wherever it is, changed. Some voyagesthe best onesare like that.